Virtual U Trevor Chan / William F. Massy / Jesse H. Ausubel / Ben Sawyer / Neil J. Salkind (U.S.A.), Enlight Software / Stanford & Kansas Univ. / Digitalmill / The Alfred P. Sloan Foundati (U.S.A.), 2000 Download it Now ! 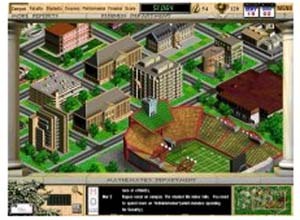 Premise: Virtual U simulates running a university or college. Storyline: Players act as president of a university or college and struggle to manage the institution's affairs. The new president sets, monitors, and modifies a variety of institutional parameters and policies. Players determine tuition cost and allocate resources for all components of the university including teaching, research, financial aid, faculty salaries, facilities, intercollegiate athletics, and fund raising. Players check their progress as time goes by and receive a letter of review from the university board every "year," according to the rate of time passage established by the player. Objective: Players strive for continuous improvement of the university or fulfillment of a unique game scenario such as raising minority enrollment.